I really think that's what has been stripped of kids today. We (myself included) are so wrapped up in email, facebook, twitter and all things techy that we've seem to have lost that little 'loving touch'. That's what these two mompreneurs thought too. They are two sisters who have done something about it. Mommy's Messages are a great way to show your kids you love them! 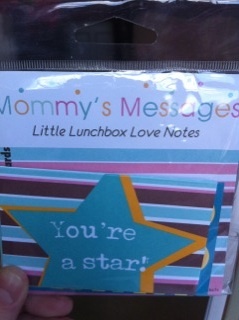 They are these cute little lunchbox love notes. They are smaller than gift card size cards and each package you buy comes with 5 little cars. For instance, we have a beagle-sharpei dog...so I of course ahd the linking for the shar-pei cards! In the pack of 5 they each have a different saying & meaning. The inside of the puppy card says 'Don't Worry Be Happy!' Plus many others to choose from. If you don't have kids-get some for a friend! Or...just buy a ton up (they are about $3 for a pack of 5) and use them for housewarming gifts-hostess gifts.. you name it. DISCLOSURE: I was given cute little messages to assist in this review. All opinions are my own.